We use reverse osmosis water from a five stage, under sink unit with a five gallon pressurized storage tank. This unit utilizes a mechanical prefilter, carbon prefilter, reverse osmosis membrane, carbon post filter, and antibacterial filter to provide water of excellent quality for us, our orchids, our homemade beer, our cats and dogs, and our tropical fish. Since the water is very pure, it has little ability to maintain a stable pH, so we usually mix our fertilizer into dechlorinated tap water at one teaspoon (five milliliters) per gallon then dilute it with three parts reverse osmosis water to feed. This gives us a final amount of one quarter teaspoon (1.25 milliliters) of fertilizer per gallon of feed water. Tap water is dechlorinated by allowing it to age uncovered for at least twenty-four hours. Water dechlorination is crucial for mixes containing sphagnum moss. The pH of the feed water should be monitored. We use a simple bromothymol blue pH test kit marketed for aquarium use. We try to use feed water with a pH between 5.4 and 6.8 for maximum nutrient availability. Water used on orchids should be room temperature. Warm or cold water may invite disease or cause unsightly mechanical damage. The use of reverse osmosis water is not a necessity for healthy orchids. We use simple titration method hardness test kits marketed for aquarium use to monitor the quality of water from our reverse osmosis unit, but these may not be accurate enough for water with high dissolved solids. Electronic total dissolved solid (TDS) and conductivity meters are available from tropical fish or hydroponics supply stores to monitor the amount of minerals in water. If your tap water is low in dissolved solids, it will be fine for use as irrigation water once dechlorinated. However, if your tap water contains more than 300 parts per million (ppm) of dissolved solids, you will be limited as to the varieties that will grow optimally. Adding fertilizer to water will drastically increase its amount of TDS; therefore, less fertilizer is required in water that already has high quantities of minerals in it. Flushing with plain water is more important when high TDS water is used in regular watering. Plants watered with high TDS water may benefit from being grown slightly more moist since dry roots are more likely to be damaged when higher amounts of minerals are present, but be sure to monitor the freshness of the potting mix to prevent root rot. 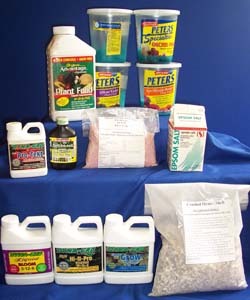 For fertilizers, we rotate between Dyna-Gro, Peters, and Michigan State University formulas. Dyna-Gro Pro-TeKt 0-0-3 is used with all other Dyna-Gro nutrient solutions to balance pH. This addition also increases the third number, representing potassium, in the fertilizer formulas. "Balanced" or nearly balanced formulas such as Dyna-Gro Liquid Grow 7-9-5 and Peters 20-20-20 are used for orchids in New Zealand or Chilean sphagnum moss. High nitrogen formulas such as Dyna-Gro Liquid Hi-N-Pro 10-5-5 and Peters Orchid Food 30-10-10 are used for those in bark or bark mixes since microbes breaking down the bark are said to use up a considerable amount of nitrogen. High phosphorus formulas such as Dyna-Gro Liquid Bloom 3-12-6 and Peters African Violet 12-36-14 and Super Bloom Booster 10-50-10 are used to induce blooming and increase flower size and count as well as to induce root growth after repotting. High phosphorus fertilizers should be applied before the plant even sets a spike to get their maximum benefit. Much discussion has been published regarding the use of urea-free fertilizers especially in bark and bark mixes. Urea is an inexpensive source of nitrogen many fertilizers contain in various proportions with ammonia and/or nitrate. Studies show that urea needs to be broken down into other nitrogen compounds before it is available to orchids. Others argue that orchids don't really need as much nitrogen as we offer them anyway. Dyna-Gro formulas are completely urea-free. Peters fertilizers utilize urea as a nitrogen source. We feel that using a variety of manufacturer's fertilizers at low concentrations and timed to match the plants' natural cycles will give very good results. We'll let you decide which is best. We usually fertilize lightly at most waterings with the fertilizer formula appropriate for each plants needs at the time and flush very well with only water the first week of each month. Water used for flushing is approximately twenty percent dechlorinated tap water and eighty percent reverse osmosis water. Phragmipedium are flushed more frequently. Water is applied until it flows from pot drainage holes. It is important that the potting mix is thoroughly wet. We water in Epsom salts at about one teaspoon per gallon of water every two or three months with unfertilized flush water. We also try to water early in the day so the leaves are dry by nightfall. Water sitting in plant crowns or on the leaves can invite rot, especially on cool evenings, when air flow is poor, and when humidity is high. Drying time will be shortened when temperature is higher, humidity is lower, potting mix components are coarser, light is higher, and pots are more porous, thus plants will require more frequent watering under these conditions. Conversely, cooler temperatures, high humidity, less light, finer potting mix components, and plastic pots will yield a slower drying rate and increased time between watering. Since temperature and light play a direct role in metabolic rate, fertilizer concentrations should be cut back when cooler temperatures and lower than optimal light prevail.